As a follow-on to the Diamant-A, CNES decided to evolve a more capable launch vehicle. The Diamant-B used a new first stage with 50% more propellants and 33% more thrust; the same second stage; and a fatter third stage. 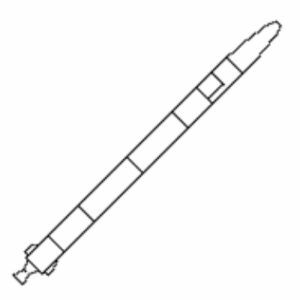 Six Diamant-B boosters were ordered. Originally four of these were to be used to test the Europa 2 launch vehicle's Perigee-Apogee System. These tests were cancelled and instead CNES used five of the six boosters for orbital attempts. Status: Retired 1973. First Launch: 1970-03-10. Last Launch: 1973-05-21. Number: 5 . Payload: 160 kg (350 lb). Thrust: 349.00 kN (78,458 lbf). Gross mass: 26,990 kg (59,500 lb). Height: 23.50 m (77.00 ft). Diameter: 1.50 m (4.90 ft). Apogee: 200 km (120 mi). 3 stage vehicle consisting of 1 x Amethyste + 1 x Topaze + 1 x P068. LEO Payload: 160 kg (350 lb) to a 200 km orbit. Stage 1. 1 x Diamant B-1. Gross Mass: 21,500 kg (47,300 lb). Empty Mass: 3,500 kg (7,700 lb). Thrust (vac): 396.522 kN (89,142 lbf). Isp: 251 sec. Burn time: 110 sec. Isp(sl): 221 sec. Diameter: 1.40 m (4.50 ft). Span: 2.30 m (7.50 ft). Length: 14.08 m (46.19 ft). Propellants: N2O4/UDMH. No Engines: 4. Engine: Vexin C. Other designations: L-17. Status: Out of Production. Stage 3. 1 x Diamant B-3. Gross Mass: 800 kg (1,760 lb). Empty Mass: 120 kg (260 lb). Thrust (vac): 50.000 kN (11,240 lbf). Isp: 211 sec. Burn time: 46 sec. Isp(sl): 211 sec. Diameter: 0.80 m (2.62 ft). Span: 0.80 m (2.62 ft). Length: 1.67 m (5.47 ft). Propellants: Solid. No Engines: 1. Engine: P6. Other designations: P-6. Status: Out of Production. Family: orbital launch vehicle. Country: France. Engines: Vexin C. Spacecraft: D, Dial MIKA, DIAL WIKA, Peole. Launch Sites: Kourou, Kourou Diamant. Stages: Diamant B-1, P4, P6. Agency: SEREB. 1970 March 10 - . 12:20 GMT - . Launch Site: Kourou. Launch Complex: Kourou Diamant. LV Family: Diamant. Launch Vehicle: Diamant B.
DIAL-WIKA - . Payload: DIAL Wissenschaftliche Kapsel. Mass: 63 kg (138 lb). Nation: Germany. Agency: BMW, CNES. Class: Technology. Type: Navigation technology satellite. Spacecraft: Dial WIKA. Decay Date: 1978-10-05 . USAF Sat Cat: 4344 . COSPAR: 1970-017A. Apogee: 1,631 km (1,013 mi). Perigee: 301 km (187 mi). Inclination: 5.40 deg. Period: 104.20 min. Engineering package.. Dial MIKA - . Payload: DIAL Mini Kapsel/P068. Mass: 52 kg (114 lb). Nation: France. Agency: BMW, CNES. Class: Technology. Type: Navigation technology satellite. Spacecraft: Dial MIKA. Decay Date: 1974-09-09 . USAF Sat Cat: 4345 . COSPAR: 1970-017B. Apogee: 1,638 km (1,017 mi). Perigee: 310 km (190 mi). Inclination: 5.40 deg. Period: 104.56 min. 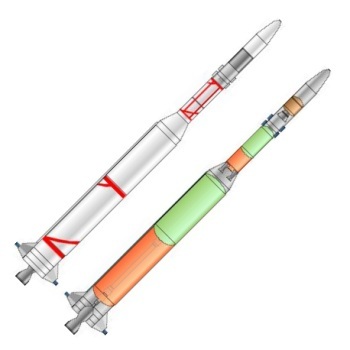 Engineering package; monitored launch vehicle performance. .
1970 December 12 - . 13:04 GMT - . Launch Site: Kourou. Launch Complex: Kourou Diamant. LV Family: Diamant. Launch Vehicle: Diamant B.
Peole - . Mass: 70 kg (154 lb). Nation: France. Agency: CNES. Class: Communications. Type: Civilian communications satellite. Spacecraft: Peole. Decay Date: 1980-06-16 . USAF Sat Cat: 4801 . COSPAR: 1970-109A. Apogee: 750 km (460 mi). Perigee: 634 km (393 mi). Inclination: 15.00 deg. Period: 98.60 min. Gathered data from meteorological balloon system. .
1971 April 15 - . 09:19 GMT - . Launch Site: Kourou. Launch Complex: Kourou Diamant. LV Family: Diamant. Launch Vehicle: Diamant B.
Tournesol - . Payload: D-2A. Mass: 96 kg (211 lb). Nation: France. Agency: CNES. Class: Earth. Type: Geodetic satellite. Spacecraft: D. Decay Date: 1980-01-28 . USAF Sat Cat: 5128 . COSPAR: 1971-030A. Apogee: 696 km (432 mi). Perigee: 457 km (283 mi). Inclination: 46.30 deg. Period: 96.20 min. 1971 December 5 - . 16:20 GMT - . Launch Site: Kourou. Launch Complex: Kourou Diamant. LV Family: Diamant. Launch Vehicle: Diamant B. FAILURE: Second stage failed.. Failed Stage: 2. D-2A Polaire - . Payload: D-2A Polaire. Nation: France. Agency: CNES. Class: Earth. Type: Atmosphere satellite. Spacecraft: D.
1973 May 21 - . Launch Site: Kourou. Launch Complex: Kourou Diamant. LV Family: Diamant. Launch Vehicle: Diamant B. FAILURE: Failure - fairing did not jettison.. Failed Stage: S.
Castor (D 5A) - . Payload: D 5A. Nation: France. Agency: CNES. Class: Technology. Type: Navigation technology satellite. Spacecraft: D. Decay Date: 1972-05-21 . COSPAR: F730521A.